The post The Real Basement Dwellers 10 – Dead Serious appeared first on The Real Basement Dwellers. Join the Basement Crew as they continue to unpack even more of the sweet gaming goodness they experienced at PAX Unplugged 2018. In this part they talk about the games they liked so much they bought them, and a few honorable mentions. Download Now Or Stream it here!The post The Real Basement Dwellers 19 – PAX Podcast Extravaganza: Revelations appeared first on The Real Basement Dwellers. Join the Basement Crew as they start unpacking all of the sweet gaming goodness they experienced at PAX Unplugged 2018. In this part they talk about the games they got to play test on the floor. Download Now Or Stream it here!The post The Real Basement Dwellers 18 – The Revenge of the PAX Podcast Extravaganza appeared first on The Real Basement Dwellers. Join the Basement Crew as they celebrate another Halloween The Real Basement Dwellers style. They talk about the games they’ve been playing, the state of the Netflix Marvel Universe, some great movies to check out and much much more. Finally they delve into a spooky extravaganza as they talk about Slasher Flick the Tabletop RPG.The post The Real Basement Dwellers 17 – Must Have Been the Wind appeared first on The Real Basement Dwellers. Join the Pseudonym, Drakaunus, Wheelord and Meobius as they fly off the rails and go off on an epic Geek News tangent where they talk all things DC Universe, Buffy the Vampire Slayer Revival, all the new streaming services coming your way, games as a service, and everything right and wrong with it all asThe post The Real Basement Dwellers 16 – Get Off Our Lawn! appeared first on The Real Basement Dwellers. The Real Basement Dwellers 16 – Get Off Our Lawn! Join The Pseudonym, Drakaunus and Wheelord as they talk about a new retro console on the horizon, the future hope of good video game movies, gorgeous games inspired of Studio Ghibli and much more. Finally the Recon Force assembles to revisit Dungeons and Dragons Online for its 12 year anniversary! So roll up a chair,The post The Real Basement Dwellers 15 – The Return to the Dungeons of Dragons appeared first on The Real Basement Dwellers. Join The Pseudonym, Drakaunus, Wheelord, Petpluto as Geek News goes off into a ridiculously awesome tangent about the latest movies on the horizon. If that’s not your cup of tea join them for not one, but two reviews! They take a look at Blank and Untold Adventures Await from The Creativity Hub! So pour yourselfThe post The Real Basement Dwellers 14 – Drawing a Blank appeared first on The Real Basement Dwellers. Join The Pseudonym, Drakaunus and Wheelord as they start up the new year right by talking about The Pseudonym’s flight stick, doing laundry, and so much more. Then they get down and dirty as they stick it to the man in a Round Table Discussion about all things DLC and the practice thereof. So dustThe post The Real Basement Dwellers 13 – Damn the Man 2018 appeared first on The Real Basement Dwellers. Join The Pseudonym, Drakaunus and Wheelord on an Interstellar Journey through time and space where they talk about Disney’s newest deal closing in, the return of a much loved game series, the return of a childhood friend, and so much more. Finally they assemble The Recon Force to take a look at the early accessThe post The Real Basement Dwellers 12 – Interstellar Dwellers appeared first on The Real Basement Dwellers. Join Drakaunus as he hosts a cavalcade of fellow dwellers including Wheelord, Meobius, and PetPluto in a discussion about all of the awesome games, vendors, people and things they experienced at the first ever PAX Unplugged in Philadelphia, PA. Almost two hours of epic awesome sauce, in this very special episode of The Real BasementThe post The Real Basement Dwellers 11 – The Return of the PAX Podcast Extravaganza appeared first on The Real Basement Dwellers. The Pseudonym and Drakaunus, joined by Wheelord, celebrate Halloween the right way with a spooktastic episode. They talk about the loss of an icon, the loss of a thing you thought was already dead but only just died for real and several other geeky tidbits in Geek News, then they resurrect a good old fashionThe post The Real Basement Dwellers 10 – Dead Serious appeared first on The Real Basement Dwellers. The Pseudonym and Drakaunus, joined with Meobius and Wheelord, geek out about all manner of things comic books, television, video games and everything in between. 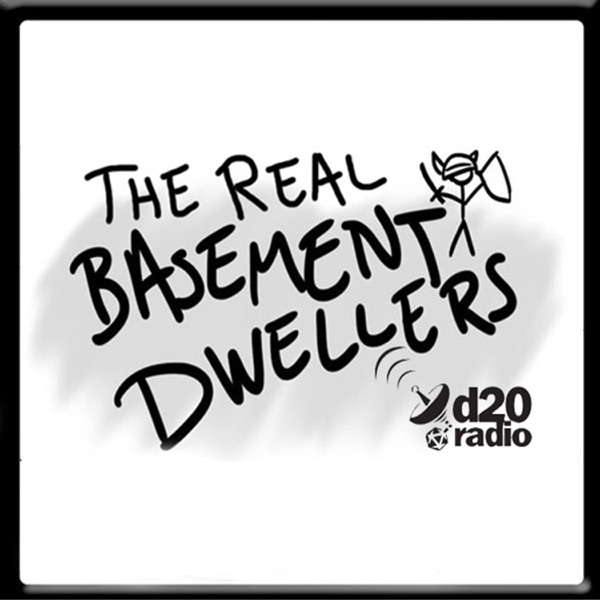 Then we get to the meat of the show with a Round Table Discussion where they rip into gaming companies and their penchant for hyping us up only to tearThe post The Real Basement Dwellers 09 – A Disappointing Episode appeared first on The Real Basement Dwellers. Join The Pseudonym and Drakaunus for another zainy adventure with their friends and cohorts Wheelord and Blaster Master of 8-Bit Legends fame. They discuss the ever expanding roster of Overwatch with the introduction of Doomfist, then enjoy a blast from the past with the discussion of the resurrection of Night Trap, and a product fromThe post The Real Basement Dwellers 08 – Precarious Parachuting Puzzlement appeared first on The Real Basement Dwellers. Join The Pseudonym and Drakaunus as they add their voices back onto the internet after a long absence. They salivate at the thought of what that new footage of Star Wars Episode 8 might look like that was shown behind closed doors, but not shared on the interwebs, then they talk about the new NintendoThe post The Real Basement Dwellers 07: Absence Makes the Pandemic Stronger appeared first on The Real Basement Dwellers. Join The Pseudonym, Drakaunus, and special guest host Blaster Master from the 8 Bit Legends for another exciting pulse pounding episode. Cling to the edge of your seat as they discuss and argue about the new hard to find item from Nintendo, how some developers produce broken incomplete garbage and call it a game onlyThe post The Real Basement Dwellers 06: One Man’s Lie for Glory! appeared first on The Real Basement Dwellers. The Real Basement Dwellers 06: One Man’s Lie for Glory! Join The Pseudonym and Drakaunus with special guest hosts Wheelord and Meobius for a awesomely spooktacular special Halloween episode. In geek news they talk the new Nintendo Switch, Red Dead Redemption 2, the new Wolverine Movie, and Star Wars Rogue One with lots of other fun bits inbetween. Finally they get to the meat ofThe post The Real Basement Dwellers 05: It’s Pronounced ‘Spooky’ appeared first on The Real Basement Dwellers. Join The Pseudonym and Drakaunus, with special guest hosts Wheelord and Petpluto as they tackle the latest in geeky news, from the DC television universe to the return of Bill Nye the Science Guy to Netflix. They also decide to talk about Nintendo and their penchant for shutting down awesome fan projects. Finally we getThe post The Real Basement Dwellers 04 – Betrayal in the House of Nintendo appeared first on The Real Basement Dwellers. Join The Pseudonym and Drakaunus, as well as special guest host Wheelord as they talk about the latest in news in regards to Nintendo, Star Wars, and maybe even some Grand Admiral Thrawn action, which leads into a mini review of the new Augmented Reality mobile game that is quite literally sweeping the nation, maybeThe post The Real Basement Dwellers 03 – 7 Days to Die: A Pokemon Go Story appeared first on The Real Basement Dwellers. Join The Pseudonym and Drakaunus with special guest host Blaster Master from the 8-bit legends as they take on a civil round table discussion about all things in the great war of PC vs Consoles. So pull up a virtual stool, grab a bottle of Henry’s Hard Soda, and join us for an exciting discussionThe post The Real Basement Dwellers 02: PC Vs Console appeared first on The Real Basement Dwellers. Join The Pseudonym and Drakaunus as they take a retrospective look at Star Wars: The Old Republic and its current state of the universe. The post The Real Basement Dwellers 01: The Remake of the Special Edition Reboot appeared first on The Real Basement Dwellers.